Former Dodger Kenny Landreaux made an appearance at Frank & Sons in the City of Industry. For this signing a purchase had to be made. I purchased a $5 photo to get signed. Kenny also signed a couple of outside items that I brought from home for no additional charge. 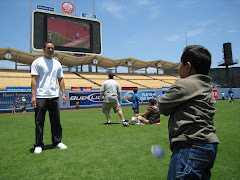 This was similar to the event the previous week that featured another former Dodger Derrel Thomas. Derrel Thomas made an appearance at Frank & Sons in the City of Industry. Derrel is a member of the Dodgers 1981 World Series team. I purchased a photo for $5 to get signed. I also had him sign my Dodgers jersey that already had a couple of signatures from other former Dodgers. He is one of the nicest former players I have ever met. Thanks to Frank & Sons for this $5 signing. Video of Derell signing autographs. Thanks to Frank & Sons Collectible show for these events.